A child born into rural Ireland in the late 1840s or early 1850s faced challenges unparalleled to that of any Irish person for hundreds of years in Irish history. Their parents and grandparents’ generation had been decimated by the failure of the potato crop. The spectre of growing up with the ghosts of parents, grandparents, brothers, and sisters, all either dead from famine fever or dead to the land of their heritage through emigration, hung over this generation, who were forced to mature into adulthood before their time, to aid in the sustainment of what was left of their families, and to forge a meagre path for their own lives. They received little help from successive British governments in this overwhelming task. The laissez faire policy of successive governments to the continuing ruination of Ireland continued as the post-Famine generation matured into a cold middle-age. This lack of help did as much to fuel the fireside stories of future generations as all the devastation of the Famine. Tales of the Famine-Queen, roads to nowhere, and the Indian meal all shaped the young minds of the generation who would eventually strike for Irish freedom in the 20th Century. One of the first real signs of aid to the beleaguered poor of rural Ireland, specifically the poor of the labouring class, came with the 1883 Irish Labourer’s Act. The Act was intended to bring relief to the masses with the provision to initiate schemes for building labourers' cottages with half acre allotments. The expenses associated with the construction of the cottages was to be met from local rates. However, the fact that money would have to be raised at source led to the near collapse of the scheme and certainly resulted in the snail’s pace of progression of the actual building of cottages. A full two decades of the scheme saw little material change in the lives of the labourers of Camross. The building of cottages was still fraught with bureaucratic delays. A farcical meeting of the Mountmellick Poor Law Union in February 1903 highlights the utter frustration that was being felt at two decades of delays and hardship. Ever since the extension into Ireland of the Poor Law Act in 1838, Camross had been situated in the Mountmellick Poor Law Union. It was in the boardroom of the Mountmellick Union that all decisions on cottages were made, or not made as the case often was. The February 1903 meeting began like hundreds of others for the previous twenty years. Union members were there to consider representations from the districts of Maryborough, Mountrath, Emo and Coolrain (which would have taken in all of Camross). Along with the Councillors in the boardroom, there were a number of solicitors who were there to oppose representations for cottage construction. Each solicitor had been hired by land owners whose land the cottages were to be built upon. Before the meeting began, a motion that the boardroom should be cleared of all people bar councillors and legal staff was defeated which led to the doors being opened to the public and a large crowd of labourers whose cases were to be considered entered the room. The proceedings began very amicably but things changed when legal oppositions to representations began to be mentioned. Further labourers began to move into the boardroom and began to stand amongst the councillors and shout and interrupt proceedings as they vented their opposition. The chair sporadically gained control of proceedings but would lose it again at the very mention of some opposition to a representation. Representations from the Emo dispensary district were heard and were largely approved but proceedings took a turn for the worst when matters turned to Coolrain. The first two representations were rejected on a vote by the Union which was followed by uproar and the work of the District Council ground to a halt. The chairman declared that he would not proceed until the boardroom was cleared of the public. Most of the labourers reluctantly agreed to retire to the adjacent relieving officer’s room but upon hearing proceedings resume through the board room door they kicked at the door until they were readmitted. By two o’clock in the afternoon the chairman decided to adjourn for half an hour in the hope that peace would break out and they could complete their work. However, once the meeting recommenced the interruptions from the labourers were worse than before as councillors attempted to shout over the uproar and conduct their business. At one stage a councillor called Bourke was grabbed and man-handled by members of the public before other councillors intervened. A full scale brawl broke out with liberal use of fists and feet. Several more placid observers stood upon desks and chairs to get a better view of what was happening. All the while the proceedings were still taking place. Councillor Odlum of Portarlington handed in a motion to adjourn the meeting for four weeks and this was wisely passed. The clerk and chairman then took all the papers in connection with the meeting and ran from the boardroom as the fight was still taking place. Another councillor attempted to leave the meeting but was pushed over a chair by the mob and was kicked and beaten and dragged towards the exit before being thrown out. The extraordinary proceedings of this meeting in Mountmellick was illustrative of a deeply divided society which seemingly had barely evolved from the medieval feudal system. Rural labourers, of which there were about 300 in Camross at the turn of the century, were on the very bottom of a pyramid dominated, as it had been for hundreds of years, by a family who had clung on to the coattails of Cromwell in the 17th Century and had aided and abetted the destruction of the old Gaelic way of life in the Slieve Blooms. 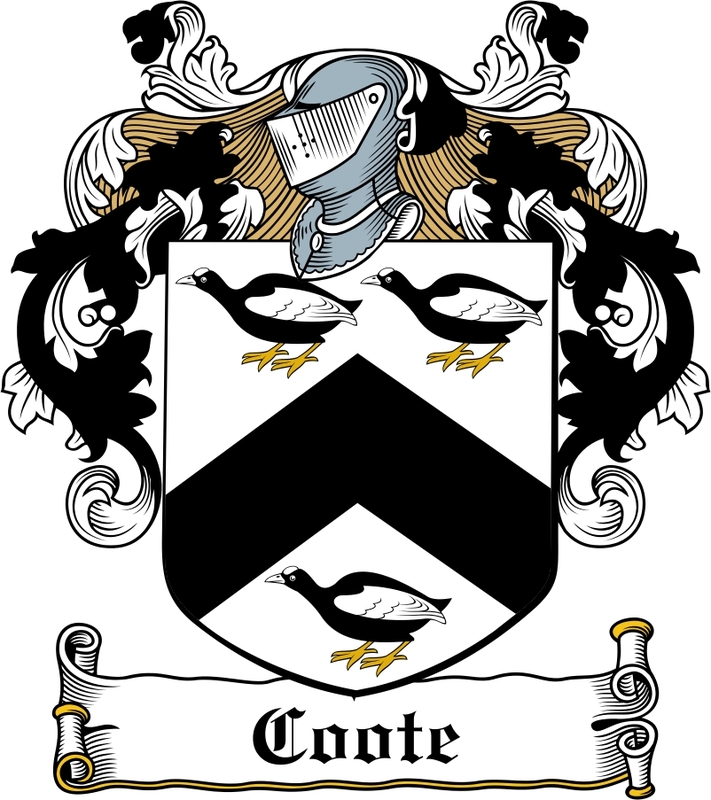 However, it would not be long before the dominance of the Coote family would finally wane. By October 1903, the Wyndham Land Act, which saw the government step in to effectively bring about an end to landlordism, began to have its circumstances felt throughout Ireland. The unchecked dominance of landlords over the rural poor of Ireland was nearing an end. But in Camross, and the remainder of the Coote estate, the end would not come quietly from the incumbent Baron of Ballyfin, Sir Algernon Coote. Algernon Coote was born in December 1847. At the time of his birth the estate was owned by the 9th Baronet, Sir Charles Henry Coote. Algernon became the 12th Baronet in November 1899 after the death of his father. Upon his death, Algernon Sr. was praised for the provision of a water supply at great expense for Mountrath and the erection of a fountain in the town. Much was expected of his successor in continuing to strengthen the relationship between the Coote family and their tenants. Algernon threw himself into the various local bodies around Laois and seemed to take a genuine interest in the maintenance of his estate. He was also involved with the Queen’s County Agricultural Society and the Committee of Agriculture and Technical Instruction. Despite the continuation of the flow of good will from landlord to tenant that Algernon Sr. had established, it was apparent that the political realities of the day were about to overtake and supersede any measure of goodwill on Coote’s part. The status quo was changing utterly and nothing less than land purchase became an option for tenants. However, Coote was reluctant to give up his birth right without a fight. On 11 October 1903, a meeting of Coote’s Ballyfin tenants was held to discuss the final throw of the dice from the Baron in an attempt to keep control of his land. Coote had demanded that should any tenant wish to purchase their land outright, the fee would be 26 years purchase (meaning a price equal to 26 years’ worth of rent at the current rate). It was pointed out by the Ballyfin tenants that there were at least 300 small farmers on the wider Coote estate whose land was not worth 6 years purchase, never mind 26. The same land, it was pointed out, was barely sufficient to support a single person if rent was never paid. With rent demands as they currently were, small farmers were deeply struggling to make ends meet. In the meantime, conveniently enough, Coote had departed for Canada and would not make his demands in person. He left his affairs in the hands of Mr. Matthew Franks, a rent officer in Coote’s employment. The outspoken parish priest of Ballyfin at the time, Fr. JJ Kelly, chaired the meeting which was packed with farmers from Ballyfin village itself, Deerpark and Ballycormack. Fr. Kelly opened proceedings by setting out for those in attendance the state of affairs. He had written to Coote pointing out that due to the very inclement weather of the preceding year, including damage caused by a great storm that February, Ballyfin tenants would find it very hard to pay rent for 1903. He also inquired as to whether Coote would sell his land now as per the Land Act and take this year’s rent as part payment or, if he did not intend on selling, what reduction would be given to tenants. Fr. Kelly received a reply stating that he would be travelling to Canada and that all matters should go through Mr. Franks. Franks explained in a follow up letter to Fr. Kelly that Coote would be willing to sell if tenants gave something between 26 and 27 years purchase, which, as a result of some of the clauses of the Land Act and prior agreements made with Franks predecessors, would be the equivalent of 33 years purchase. Therefore, for a tenant to purchase their land from Coote they would have to pay a sum equivalent to 33 times their annual rent. Kelly pointed out that Coote had suggested, only three years earlier, that an equivalent of 18 years purchase was required to purchase land. The current situation was a grave one, he went on to say. He said that Coote’s current terms were completely unreasonable and he suggested that they bide their time and not respond in any way to Coote or Franks and allow the situation to develop over time in their favour. Fr. Kelly remembered the previous Baron, who had refused to bow to pressure from unnamed people to do away with a Christmas gift to tenants and had promised to reduce rent. Such commitment to the ordinary people did not continue after his death. Kelly said that Coote would earn almost half a million pounds from the purchase of Ballyfin land alone. The meeting eventually ended in an agreement that all negotiations with Franks should end immediately with regards the purchase of land. Camross tenants joined other tenants from the Kyle and Mountrath areas the following Sunday in Borris-in-Ossory to discuss the situation. The chair of the meeting, William P. Delaney MP, said that they had come that day to consider the demands that Coote was making and no sooner had the meeting begun, someone in the crowd shouted ‘Do like Ballyfin and leave him so!’ Delaney wisely surmised that if demands such as Coote’s were made all over the country then the Wyndham Land Act would fail and a compulsory land purchase bill would have to be introduced. Delaney, a founder member of the United Irish League, urged tenants to unite under the UIL banner and fight for their rights and stand up to the likes of Coote. It is evident that Coote does not want to meet his tenants. He probably expected that his tenants would again ask for a reduction of rent and on some excuse or other he has gone away to Canada. Some time ago on a public platform some delighted admirer of Sir Algernon Coote described him as an oasis in the desert of Irish landlordism, but when they came to consider the season of 1901, and this season, and the position of his poor famished tenantry, might he not more aptly be described, after such conduct, as a mirage in the desert of Irish landlordism. When his tenants are in want, when some of them want help and food, he vanished from their view. He believed there is some combination amongst the landlords of this country to stand out for the last farthing they can extract from their misfortunate tenants. By mid-November there was little sign of progress and the tenants’ plight was growing worse. A large meeting was convened, bringing together representatives of all the tenants on Coote land, in the yard of Dunne’s Hotel in Mountrath. Among the 150 attendees were Camross members of the Rural District Council; John Costigan, William Keeshan and Martin Lyons. Fr. Kelly, who was now viewed as the leader of the burgeoning movement, was voted to the chair and he opened proceedings. Fr. Kelly began backtracking on some of the comments that had been made deriding the character of Algernon Coote at previous meetings. This no doubt included the comments made in Borris-in-Ossory by Michael Fitzpatrick. Whether this was a genuine Christian effort to restore Coote’s good name in all matters bar the one at hand or whether it was an exercise in appeasing the absentee landlord, one cannot say for sure. In any case, Fr. Kelly gave examples of Coote’s good nature, including his granting of money to Fr. Kelly to complete a school in Ballyfin. The man was humane in many respects and Fr. Kelly was at pains to point this out to everyone in attendance, especially the press and any of Coote’s representatives. Fr. Kelly went on to mention how Coote had received a very threatening letter some time ago from an anonymous tenant who identified themselves as a member of the Light Foot Society. Coote called for Fr. Kelly and showed him the letter. Fr. Kelly, perturbed at the contents, threw the letter into the fire and told Coote to forget about it. He convinced him that the grievances that the letter-writer had would not manifest itself in a physical attack on Coote or any member of his family. He condemned the actions of the letter-writer and pointed out that the issue at hand was that of land purchase and rent reduction. Fr. Kelly went on to say that Coote was very reasonable throughout this encounter and Fr. Kelly’s assertion that Coote was in no particular danger was practically confirmed when he discovered that the letter writer was in fact a local aggrieved Protestant man who was close to the Coote family. Various other speakers, including Michael Fitzpatrick and John Costigan, spoke regarding the situation as it stood. It was decided that 18 years purchase was the absolute maximum that anyone should pay for their land and it was decided that a committee be set up to present Mr. Franks with this demand so that he can discuss the matter with Coote personally. On 28 November the terms were given to Mr. Franks and after a short discussion, where he assured tenant representatives that Coote would be returning home from Canada shortly, it was agreed to wait until he was present to discuss terms. I find on my return from [Canada] that my tenants have allowed themselves to be misled, and to take action, which, of course, precludes any further negotiations for the sale of this property at present. It is with very great regret that I am forced to such a conclusion, but I have no alternative, after the many unfair and unwise things that have been said and done by those who should have known better. The rents on the whole of these Estates are exceptionally low, and in this respect the poorest tenants are as well circumstanced as those who have larger holdings. There is hardly a single rent on the property which is not considerably below the Poor Law Valuation. Rents now due to the 1st May last must be paid at once in full. I have, however, instructed my agent, who has my entire confidence, and who has been so unjustifiably attacked, to note any cases of special need, and to bring these before me for consideration. It is not for me to emphasise what I have done for my poorer tenants since I succeeded to this property. Suffice it to say that I have laid out many hundreds of pounds for their benefit alone, and it has been my delight to live among them. This development was a hammer blow to the tenant poor on Coote’s land. The forceful nature of the tenants’ demands had backfired. The harsh words directed at Coote by the likes of Michael Fitzpatrick were no doubt shared by many of the tenantry but the public airing of this opinion cost them dearly. The Leinster Express, a thoroughly loyalist newspaper at the time, vociferously defended Coote stating that the situation had arisen from ‘the thoughtless manner in which the Irish peasantry allow their knowledge of facts to be diverted by clap-trap oratory’. Seeing that urgent action was needed to appease Coote, who, after all, still held most of the cards, an extraordinary letter of apology and praise was sent to Coote and published in the Leinster Express. We the undersigned tenants of the Ballyfin estate hasten to approach you to offer the expression of our heartfelt satisfaction and pleasure at having you once more amongst us. We rejoice exceedingly that you and your esteemed lady are safe home from America, and we bid you most cordially, heartily and sincerely céad mile fáilte. We are deeply pained to hear of the unkind and untrue and uncalled for remarks, concerning you and your predecessors, made by some speakers at meetings held in Mountrath and Ballyfin in connection with the purchase negotiations, and we beg leave, most emphatically, to repudiate those speakers and their observations. We acknowledge with heartfelt gratitude your many kindness to your tenants and people since you succeeded to your estate. You were never tired of showering favours upon those around you. You have spent large sums of money on charities, and generally towards the amelioration of the condition of the poor. You have never been a harsh landlord, but, on the contrary, a most kind and indulgent one; and you have merited by you generosity and kindness of heart the title of Father of your People. In conclusion, we pray that the giver of all good may pour his choicest blessings on you and those near and dear to you and beg to remain, with profound respect, your obedient servants. The letter was then signed by 117 of Coote’s tenants. The vast majority of the signatures came from men and women who, no doubt, wouldn’t dream of wishing the Father of your People and his wife one welcome, never mind one hundred thousand of them. But Coote’s letter before Christmas left them with no choice but to do whatever they could to mend the broken bridge, even if that meant gratuitous grovelling. Leinster Express, 14 Nov. 1903. Leinster Express, 2 Feb. 1904. Leinster Express, 15 Oct. 1904. Leinster Express, 15 June 1907. The 117 people that signed a letter, published in the Leinster Express, praising the character of Algernon Coote on 2 February 1904. Coote expressed his gratitude for the letter and said that he was of the opinion that those who spoke ill of him were in a minority and that he loved living amongst them all. He wished them a happy new year. No reference was made to land purchase or the worsening plight of the tenants. There were no developments whatsoever until October 1904. Representatives of the tenants met with Matthew Franks in his office in Mountrath. The terms proposed were between 26 and 28 years purchase, depending on circumstances. This was still far in excess of what the tenants had demanded in 1903. A meeting of tenants was held in Mountrath some weeks later to discuss the terms. Fr. Kelly wanted to stick to the original demand of 18 years purchase. However, convictions were clearly weakening. Several tenants were happy to pay between 20 and 22 years purchase, edging ever closer to Coote’s demand. There was also disagreement over turbary rights and what would be done with unoccupied land on Coote’s estate. It was apparent that the unity of the tenants had dissipated. The Coote estate was eventually divided up into fourteen different sections and slowly tenants acted on their own to purchase land at varying rates. The purchase price of some of the land seemed far in excess of even the most generous compromises suggested in tenant meetings during 1903. In June 1907, Franks revealed that some of Coote’s tenants had purchased land near Mountmellick town at a cost of between 23 and 26 years purchase. This inordinate price upset the likes of Fr. Kelly who remained a prominent defender of the rights of the tenants on the Coote estate. In 1909, Augustine Birrell, the Chief Secretary of Ireland, extended the 1903 Wyndham Land Act to allow for the compulsory purchase of land from landlords unwilling to sell. This was the finale of the centuries-old tragedy of landlordism in Ireland. For the first time in centuries the ordinary people were in control of their land and could now push on for the control of their country. On 22 October 1920, Algernon Coote died. His son Ralph succeeded him as the 13th Baronet. Ralph sold Ballyfin House to the Patrician Brothers shortly after assuming the position of head of a significantly reduced estate. The current Baronet, Ralph’s grandson, Christopher John, is the 15th Baronet. The family name lives on in the form of Christopher John’s son, and grandson, the future 16th and 17th Baronets. Ballyfin House was a secondary school for decades before assuming its current role as one of Europe’s most exclusive hotels with room rates of up to €1,700 a night.